In 2016, a number of news sources, notably Bloomberg, reported on a secret and highly ambitious plan inside Amazon to provide broad logistics services for goods made in China and shipped to the US and someday Europe. "A 2013 report to Amazon's senior management team proposed an aggressive global expansion of the company's Fulfillment by Amazon service, which provides storage, packing and shipping for independent merchants selling products on the company's website," Bloomberg reported at the time. "The report envisioned a global delivery network that controls the flow of goods from factories in China and India to customer doorsteps in Atlanta, New York and London." Small Chinese manufacturer will be able sell to American consumers with no one else than Amazon between them. The project's name: Dragon Boat. As part of that strategy, Bloomberg reported Amazon had plans to take on freight forwarding and brokerage services directly, eliminating a set of middlemen. "Amazon wants to bypass these brokers, amassing inventory from thousands of merchants around the world and then buying space on trucks, planes and ships at reduced rates," Bloomberg added. "Merchants will be able to book cargo space on-line or via mobile devices, creating what Amazon described as a 'one click-ship for seamless international trade and shipping.'" Amazon has spent most of the intervening time denying it has such plans – even though in 2016 Amazon received a license to act as a wholesaler for ocean container shipping from the US Federal Maritime Commission. A bit earlier, the Chinese Ministry of Commerce granted a similar license, under the name Beijing Century Joyo Courier Service Company Limited, one of the trade names for Amazon China and Amazon Global Logistics China, according to documents posted on the Ministry of Commerce website. Now, article in USAToday says Amazon logistics is moving strongly ahead – a transporting a growing amount of freight. Amazon shipped some 4.7 million cartons over the past year, the paper reported. At the beginning of 2018, Amazon had moved about 5300 containers from China to the US – a number that certainly rose over the past year. Per the predictions in 2016, "This makes [Amazon] the only ecommerce company that is able to do the whole transaction from end-to-end. Amazon now has a closed ecosystem," Steve Ferreira, CEO of Ocean Audit, told the USAToday. His company's research first uncovered the increase in Amazon logistics volumes, after analyzing shipping databases such as Distribution Publications, Inc. and ImportGenius.com. The containers are moved under the name Amazon Logistics or the aforementioned Beijing Century Joyo Courier Service Co. They are sent from ports in China to either the Port of Long Beach or the Port of Seattle and from there to Amazon fulfillment centers. USAToday reports that Amazon provides just the trans-Pacific portion of the trip or end-to-end service for companies that want it. That, it says, can involve pick-up at the factory in China, ocean shipping to a US port, and truck carriage to Amazon fulfillment centers, as well as freight forwarding services. In fact, the paper says, Amazon Logistics and Beijing Joyo have published tariffs that describe the types of services and fees that their clients can utilize. And all that "gives Chinese goods a seamless path from the factory floor all the way to the front steps of an American buyer's porch," Cathy Roberson, founder of Logistics Trends & Insights in Atlanta, told the USAToday. 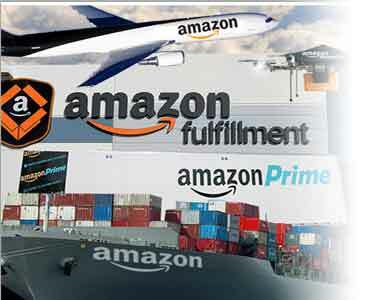 While the number of containers Amazon is moving is just a blip in the market for now, the possibility that Amazon could step up to be the giant player in the freight forwarding and ocean carriage market is certainly there – with Amazon offering numerous path for getting goods into the US and ultimately to customers. "This has been the goal, they've wanted to control the entire supply chain," Robertson said to USAToday. Amazon's secrecy about its efforts is because it doesn't want to create scrutiny to its plans to move into yet another market it eventually plans to dominate. That according to Brittain Ladd, formerly a senior manager with Amazon Global Logistics and before that at Dell, and now a supply chain consultant. Among the most important ramifications from Amazon's vision: small Chinese manufacturer will be able sell to American consumers with no one else than Amazon between them. Will Amazon provide its services only for Chinese manufacturers selling goods through Amazon? That is the trillion question, but note this: the USAToday says a job posting with Beijing Century Joyo in Shanghai describes the ideal candidate as someone who will help the company in "disrupting the way products are bought, sold and distributed on a global scale." What do you think of Amazon's logistics plans? Will it succeed? Let us know your thoughts at the Feedback section below.